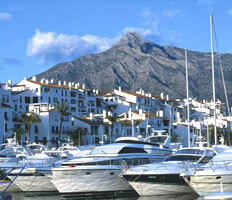 Marbella is located on the southern coast of Spain in Andalucia. This town, together with Puerto Banus, is a favourite destination of everyone from the rich and famous to your average holidaymaker. 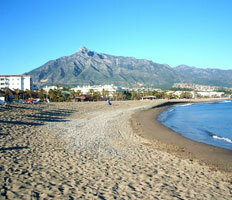 Marbella has various clean beaches with life guards, where you can have a refreshing swim on hot summer days. Some of Marbella's famous residents (now or in the past) include Antonio Banderas, Joan Collins, Sean Connery, Vincent Cronin and many more! 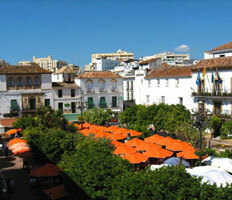 You can visit Marbella by booking a private luxury taxi or booking a Malaga excursion or day trip. All our chauffeurs speak English and Spanish. Marbella has a lot to offer. Its kilometres long boulevard opens out onto clean beaches with beach-chairs for rent and chiringuitos (beach bars) in which to have a drink or to eat good fried fish dishes (known as "pescaito"). In the old town you should definitely visit the Orange Square. At this square, situated in the historical centre of Marbella, you will find the 16th-century town hall, which is also where the tourist office is. The Orange Square, or "La Plaza de los Naranjos", as the Spaniards call it, is surrounded by beautiful buildings, small shops, galleries, romantic restaurants, trendy tapas bars and bars with sunny terraces in which to have a drink. Departing from the Orange Square you can walk through the narrow streets and explore the bars, restaurants, shops and fashion shops selling exclusive brands. Arabic wall in the historical centre. The town hall at the "orange square"
The "Iglesia de Encarnación", a church in the old centre. Bronze statues created by Salvador Dali at the Avenida del Mar. The Alameda Park with ceramic sofas, and horse-drawn carriages for Marbella sightseeing. 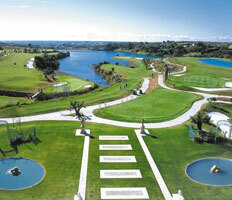 Over 10 golf courses, you will find some of the best golf courses of Andalucia. - Do you need a list of the best Marbella golf courses? Then take note of the following: Guadalmina Golf Club, Los Naranjos, Marbella Golf and Country Club, Santa Clara Golf Club, Rio Real Golf, La Quinta Golf & Country Club, Aloha Golf Club, Atalaya Golf and Marbella Club Golf Resort. Marbella is full of five-star hotels and luxury resorts located in the area of the Golden Mile, located between Marbella and Puerto Banus. Enjoy your holiday thanks to fantastic beach days at the likes of: the Bajadilla beach, Cabopino beach, Artola beach (with its little port), Cortijo blanco beach, the Faro beach, the Fontanilla beach, the Cable beach, Guadalmina, Venus, the Cañas, the Chapas, Linda Vista, Casa Blanca (with its charming pier), the Pinillo and countless others. The prestigious port of Puerto Banus is known for its expensive yachts, shops and boutiques of luxury brands like Dolce & Gabana, Loewe, Gant, Louis Vuitton, Lanvin Paris, Dior, Burberry, Cartier and Bvlgari. Visit the Business Park La Cañada, where amongst the other shops and restaurants, you will find an App Store of Apple, other shops like Fnac, Alcampo and all kinds of franchises both in stores and in restaurants. 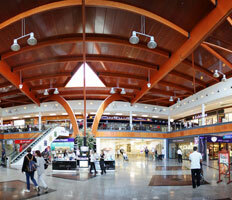 The Marbella Casino is situated in the area of Puerto Banus. The town of Marbella is near various other interesting places, such as: Ronda, Mijas, Fuengirola and Estepona, etc. A lot of visitors take advantage of this fact and get a transfer to these wonderful locations in the province of Malaga.